Verifiable income can come in various forms. An apartment complex will typically will look at your employment history. They like to see that you have six months to a year of employment history. They also want to see that you earn three times the rent. So if you're looking to spend $700 on an apartment, they want to see that you earn at least $2100 a month in gross monthly income, which is your pay before taxes are taken out. As far as what proof of income apartments will need, a paystub is usually the standard, but bank statements would be an option if you are relocating to Austin and are still looking for a job. In that case, an apartment manager wants to see that you have the amount of the rent times the lease term. In other words, if you are leasing an apartment that is $700 per month for a twelve month lease, they'd want to see $8400 in your bank account. If you are just starting a new job, apartment complexes won't hold that against you. They will just ask you for a letter of hire on company letterhead stating when you plan to start your job and how much income they anticipate that you will be making. If you are a student or do not have the required income, you can use a a co-signer. A co-signer is a person that is willing to vouch for you and can ultimately be held liable if you can't pay rent. The apartment complex can fax a co-signer application to your designated person, usually a parent. The co-signer doesn't have to live in Austin or even in Texas to qualify. The co-signer just fills out the co-signer application and returns it and the complex will use the co-signers income as verification. The co-signer does typically need to make more than three times the monthly rent. Some complexes do not put as much emphasis on the income verification. They will look at credit, criminal history and they will use 401k's or gifts as proof you can afford the apartment. Sometimes apartments will even allow financial aid if an applicant is a student, as long as it shows enough income to suffice for the entire semester. If you have any questions about income verification, be sure to contact a qualified apartment locator. Renting without a social security number can be tricky because properties use your social security number to pull your credit history. But many customers who relocate to Austin for a job or to go to school are coming from another country and don't have a social security number. There are two categories of people without social security numbers who are relocating from other countries: documented and undocumented. Documented typically means you are a student, and you have a visa or an I-9. Properties can usually have you fill out a non-resident or supplemental application, for which they'll need documentation showing your visa, passport, and/or school documents. Of course they'll want to see financial documentation that you can afford the apartment. Usually a co-signer is used, but if you don't have a cosigner with a social security number, often they can use bank statements to show proof of income in the bank that will suffice for the least term. Undocumented customers will often be asked to show some kind of ID from their country, often it's the matricula card, and they can show that to prove who they are. Properties can't pull any sort of credit report so they usually will ask for one month's rent deposit. There are some that apartments that are more flexible than that, but on average a month's rent is what you are looking for as a deposit. Undocumented potential tenants will also need to prove income, so a letter from your employer will suffice. If you have any questions about qualifying for an apartment without a social security number, call your local apartment locator. They can usually answer any questions you have and help you find an apartment complex that will work with you. Ten Oaks Austin is a new apartment complex located in North Austin on Lamar Boulevard just north of Parmer. This community of 192 apartments is located along the banks of Wells Branch Creek. Apartments range from a 693 square foot one bedroom to a 1,396 square foot three bedroom, two bathroom. 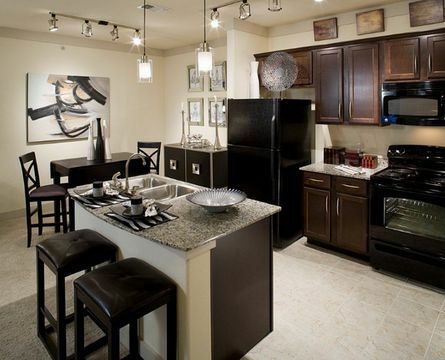 Rents range from $779 for a one-bedroom to $1392 for a 3-bedroom. Apartment kitchens feature black appliances, brushed nickel fixtures, granite countertops and islands. Ceramic tile floors, nine foot ceilings with crown molding, private and semi-private balconies, and garden tubs in the master bathrooms add to the feeling of luxury in these beautifully appointed units. Life is also convenient at Ten Oaks with washers and dryers in every apartment, spacious walk-in closets, and with U-Verse Internet available. The Ten Oaks community has a clubhouse with wi-fi, a fitness center with the latest equipment and a Personal Cardio Theater, a resident business center, and a cyber cafe. For entertaining and relaxing, there's a resort style pool, barbecue grills and a smoker, an outdoor fireplace with conversation pit, a gaming lounge with a Wii and a billards parlor with Plasma TV. When it's time to venture out into the world, getting to work and play will be a snap because of Ten Oaks' convenience to I-35 and other area highways, as well as nearby restaurants such as French Quarter Grille, Bombay Express, Red Robin and Zed's Restaurant. If you love to shop, Ten Oaks is close to the Tech Ridge Shopping Center where HEB, Super Target, Super Walmart and lots of other convenient stores can meet any of your needs.